It’s such a shame when you really want to like a show, but you just don’t. 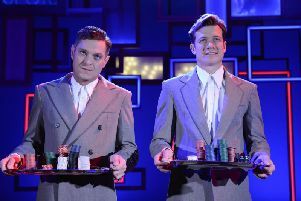 I was really looking forward to Mischief Theatre’s The Comedy about a Bank Robbery, which opened at Milton Keynes Theatre on Tuesday as part of its UK tour. This is the company behind the sell-out, multi award-winning comedy The Play That Goes Wrong, a breathtakingly daring, slapstick account of all the disasters that could possibly befall the hapless cast of an am-dram murder mystery production. The Comedy about a Bank Robbery is set in summer 1958. Minneapolis City Bank has been entrusted with a priceless diamond, but an escaped convict is set on pocketing the gem, with the help of a motley crew of others. Having loved The Play that goes Wrong, I fully expected also to be wowed by The Comedy about a Bank Robbery. But,sadly, it left me lukewarm. I must clarify, however, that I seemed to be very much in the minority, and other members of the packed audience around me were roaring with laughter. But humour is a subjective thing and this one just didn’t do it for me. Where it did work for me was when the play used the same physical slapstick comedy that was employed to such great effect in The Play That Goes Wrong. This included members of the cast repeatedly getting trapped in a fold-up bed, and three of them being lowered by rope one by one into the bank vault and ending up stacked up in a heap like conkers on a piece of string. There was also one truly inspired and totally surreal scene that played havoc with one’s sense of perspective, where the audience were led to believe we were looking down on the action from above, whereas in fact the cast were suspended in mid air from the back wall. But overall, I felt that the comedy in this production was less physical, and more verbal, with lots of repetitive punning. I found the accents sometimes impenetrable and some of the ‘business’ downright confusing. For me the show lacked pace and the musical numbers were too strident and generally felt like an intrusion rather than an enhancement. 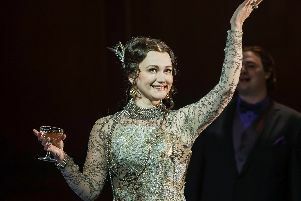 However, you can’t fault the energy and good humour of the young cast, and, as I said before, on the whole the first night audience seemed to love it, so all I can say is, I guess it just wasn’t my cup of tea.